As the dusk drew the day to a close on the evening of March 11, the faithful from across the tri-state flooded the hall of the St. Gregory the Great Chapel at Mount St. Mary’s Seminary, the sun setting upon the warmest day of the year thus far, welcoming the new spring. On this night, local Catholics would have the chance to hear from Cardinal Óscar Andrés Rodríguez Maradiaga, a close friend of Pope Francis, who is paying witness to a different coming season – a new spring, if you will, for the Catholic Church. Elected to the cardinalate in 2001, Cardinal Rodríguez has served as the Archbishop of Tegucigalpa since 1993, in addition to serving as the head of the group that advises Pope Francis on matters of the Roman Curia, the Vatican’s administrative ensemble that assists the pope in overseeing the Church. Before becoming a bishop, he spent time teaching chemistry, physics, and chemistry in Central America, training in classical piano, and adding five languages to his repertoire, on top of his native Spanish. During his five-day stay in Cincinnati, Rodriguez spent time meeting with local Catholics, giving two talks at the Athenaeum, spending personal time with seminarians, and even speaking with students at Seton High School on March 9. An avid aviator, Rodriguez paid a visit to Dayton, where he toured the Air Force Museum before receiving the University of Dayton’s Archbishop Oscar Romero Human Rights Award, a symbol of recognition that is largely a result of his role as President of Caritas Internationalis, a Catholic relief organization that works to build a better world for the poor and oppressed. “I feel at home,” Rodriguez told the Athenaeum crowd as he was welcomed with a standing ovation. The Cardinal began by speaking of his experiences as a member of two papal conclaves, the first of which took place in 2005, following the death of Pope Saint John Paul II. Having joined the cardinalate during the same year as Jorge Bergoglio prior to the latest election, the two had become close friends, and Rodriguez was especially excited to see his colleague become pope. According to Rodriguez, the results of the election took Francis by complete surprise. Today, Rodriguez still remembers the words the new pope had spoken on the night of his election, after hearing of the conclave’s decision to install him as the leader of the Catholic Church. Just four days after the conclave had reached their decision, Rodriguez received a call from the Vatican; expecting it to be from an administrator, he was shocked to hear the familiar voice of his friend on the other end of the line. The call turned out to be an invitation to lunch at the Vatican, where Pope Francis asked Rodriguez to lead a new commission of eight cardinals, who would become his central group of advisors on matters of the universal Church, focusing mainly on the reform of the Roman Curia. Accepting the invitation, Rodriguez realized that he was going to be spending a great deal of time with the pope, whose decision to live in a 60 sq. meter apartment had already come as a surprise to many early on in his papacy. “Francis chose to live with the people,” Rodriguez explained, remembering a specific instance during which the pope extended a mass invitation to the gardeners, most of whom had never been invited inside the history-rich walls of the Vatican; that day, they were made the guests of honor. Soon after, he extended a similar invitation to 3,000 Vatican cleaning personnel, personally greeting each employee following Mass. “It’s beautiful – this closeness of the pastor with his sheep,” Rodriguez said. This closeness was further demonstrated, Rodriguez explained, when he accompanied Francis to Assisi on Oct. 4 for the feast of St. Francis. Ever the one to travel simply, they landed in a soccer field instead of on an airstrip, immediately departing to visit handicapped children at a local center, before Francis went on to take his lunch with the poorest of the poor, rather than with the bishops and priests. “You can’t imagine the atmosphere of happiness,” Rodriguez said of the visit. In describing Pope Francis as an individual, Rodriguez focused on three key words, which he believes to encompass the goals of the current papacy. This, Rodriguez said, was the main goal of the Catholic Church under Pope Francis: to recover the Church’s status as that of a global mission. Rodriguez also stressed the importance of praying for the pope, who rarely takes time for vacation, despite his demanding schedule. Similarly, he spoke of the need for evangelization and prayer in those parts of the world that have not been touched by Christianity. This change of heart, Rodriguez insisted, is not far away. With a number of students scattered throughout the audience, Cardinal Rodriguez shifted the focus of his talk to the future of young people in the Church, comparing the passage of faith between generations to the light of the Olympic torch. This community the Cardinal spoke of, must be built from the inside-out. The revolution that he described must begin in our everyday lives, through the ways in which we treat not only our friends, but our enemies as well. 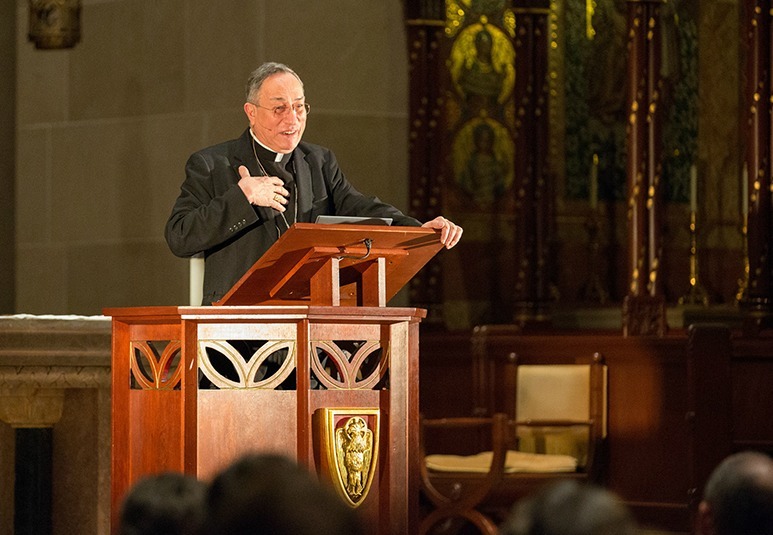 To see the full live-streamed version of Cardinal Rodriguez’s talk, click here. You are the best of the best!